I must declare, that Sheikh Mohammed must be a very proud poppa to such a gorgeous offspring! Sheikha Maitha Bint Mohammad Bin Rashid Al Maktoum is one of the younger (b. 1980) daughters of Sheikh Mo, and she is an absolute betty (if you don't know what "betty" is - then go watch "Clueless")! Not only she is beautiful, tall (5.9 ft), has loads of moolah and blue blood, but she is also an accomplished Olympian. Let me ask you how many of the world's hot royals can boast such a claim? Prince Harry? Princes Beatrice? Various Monaco Princesses? 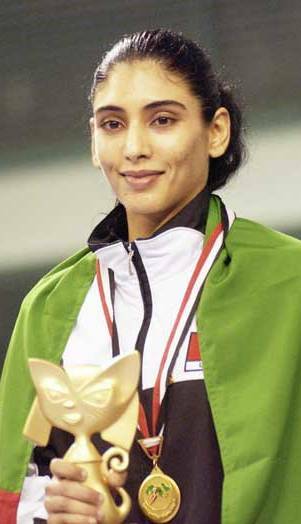 Sheikha Maitha participated in 2008 Beijing Olympics in martial arts competition and also was a flag bearer for the Dubai Team. I don't think she won anything though. 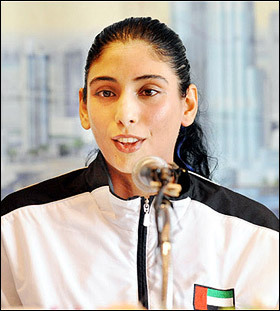 Anyway, she is seriously into karate and actually won 4 gold medals in Gulf championships. Additionally, Sheikha Maitha is involved with "Dubai Cares" charity, which works for providing decent children's education for impoverished nations.